Whilst we do complete most badges as a whole group at weekly Beaver/Cub/Scout meetings, we also encourage young people to work towards some by themselves. The available badges for each section and the requirements for each can be found under the badges section in our menu. Core badges. These are badges which everyone will achieve over their time in Scouting, like district, county and world badges. 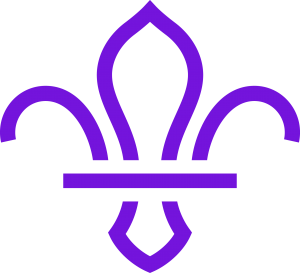 They also include the purple membership badge which every Scout in the world wears, and badges which indicate how long you have been in Scouting. Activity badges. These are yellow, red or navy circular badges. They are available for a variety of topics, including astronomy, cooking, horseriding, science, athlethics, and many more. Staged badges. These are light blue circular badges, with a number on. They cover progressive development of a range of skills, like navigating, digital, swimming and nights away. Most of these will be completed outside of the section meeting, either at home or on section events and camps. Challenge badges. These are hexagonal badges. They are the most difficult to achieve, and will be completed within section meetings and activities. To be awarded a badge, we must see evidence that the young person has fulfilled the requirements for that badge. For badges showing development of a particular advanced skill (e.g. swimming, musician, horseriding), a signature from an appropriately qualified teacher/instructor is suitable evidence that a young person has fulfilled the badge requirements.For the more hobby-based badges (sports enthusiast, book reader, collector etc.) it may be necessary for the young person to talk to a leader about what they have done for the badge or speak for a short time in front of the rest of the Beaver Colony/Cub Pack/Scout Troop about their badge. Challenge badges (the hexagonal-shaped ones) require significantly more work including attendance at camps and other events. A young person will usually achieve all the Challenge badges required for their Chief Scout’s Awards through regular attendance and participation in activities during the years they are with us. Our programme is designed to cover all the requirements for these awards. Most badges are only bought in when required, so we may not be able to present your child with the badge immediately after they satisfy the requirements. If your child is intending to complete a badge, or you have any other questions, please contact your Section Leader. Created by Andrew in July 2013. Last reviewed by Slimer in Feb 2018.